Involving learners is key to engaging them and making sure that the information actually sticks. Information that doesn't stick, is useless if it turns out that there is no way for the learner to recall the info nor put it into practice. It's "where the money is", or better yet, where the money is lost. After all, why would we put all of this energy into the logistics of teaching valuable information to our employees when we aren't even sure if it's useful? Or if it is going to favor the enterprise at all? All of these processes can only be achieved by making your course interactive. In an environment where content is king when it comes to learning, it goes without saying that it is worse to have an interactive course with poor content than to have a non-interactive course with really good content. This is where interactive learning software can really help you focus on your content. This eBook doesn't only give insight into the different methodology of approaching your learners. It puts a lot of emphasis on why 'interactivity' is important. Why would you want your learners to interact with content in the first place? Understanding this is key before you are able to proceed. 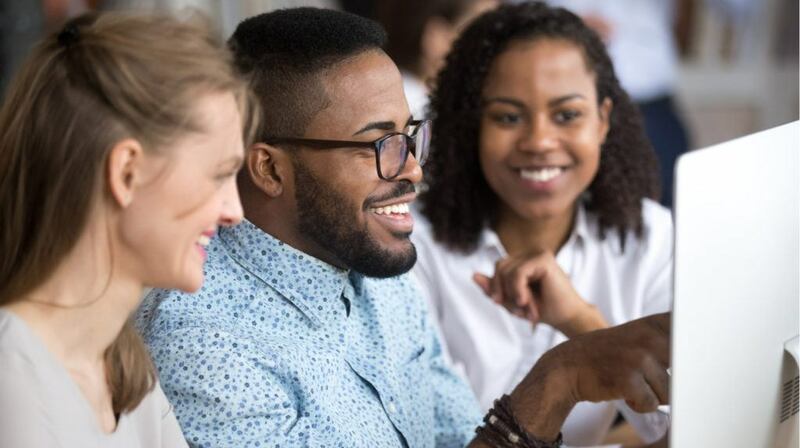 Interactivity encourages autonomous thinking, offers an environment which can deliver feedback instantly and can do so most often in a fun and playful manner. From the power of storytelling to appealing into someone's emotions, there is an excess of extremely useful ways to entice your crowd, instead of letting them dream your time away. Interactive Learning Design: Using An Interactive Learning Software To Increase Engagement In eLearning Courses elaborates on the various forms of interactivity which exist, and the best practices that they can help you implement to keep your employees engaged and enthusiastic. By now it should have become clear that to immerse your learner you have to make her or him (an engaging) part of the process. There are different reasons you want your employees to learn. It depends on the environment they are working in, the tasks they need to fulfill and over which timespan they have to realize the final product. There is a variety of interactive elements you can choose from to suit the learning goals in the best way possible. Whether you start from scratch or use the 'rapid interactivity building approach'. The latter offers plenty of ready-to-use templates. The infrastructure is in place. All that is left do to on your side is insert your own custom content. Based on your reason(s) for learners to interact with the content and your ultimate learning objectives, you can shortlist the interactive elements that you would need in your course. And from there onwards you can commence the process of creating these elements. You could build these using either the traditional skill-based approach where you build each element from scratch or by using the rapid interactivity building approach, which makes use of engaging interactive learning software. This eBook elaborates extensively on the options you have. Simultaneously, it tells you which criteria the checklist should adhere to. A checklist with must-have features to make the perfect choice when it comes to the actual software. If you don't know where to start right off the bat, ‘Interactive Learning Design by Raptivity’ gives some truly useful insight on what best practice consists of to drive engagement. Chances are that you will have a most positive association and memory of that one teacher that engaged you in a fun and interactive manner. Besides the fond memories, chances are that some of that info may even have stuck and better yet, it might have created an environment where you liked the content. Maybe still to this day! Telling a story is one of the oldest and most traditional human skills around. People like stories because they evoke emotions. Whereas "the top 10 skills an instructional designer needs to possess" might tickle someone's fancy, it is highly unlikely to be a highly engaging emotional rollercoaster piece of content by itself. What is great about an engaging story is that it often includes a lesson which can be learned, a certain morale. Additionally, the interactive element of the story appeals to the contestant or learner because of the acknowledgment of their presence. The work by itself is re-affirming. A positive association follows. The checklist they offer of what you need in an interactive learning software helps you on your way to make the right choice to a solution which fits your company's needs. It is essential to spend the budget wisely. The aftercare consists of an explanation on best practices that you can follow to keep any commonly-faced challenges at bay. Ranging from using the right amount of interactivity, including a good mix of interactions to reusing templates. The great thing about Interactive Learning Software is the additional and indirect value it creates for your company. When you don't have a graphic designer on-board it doesn't really matter. Because the software enables you to build content effortlessly, by yourself. Instead of focusing too much on making it pretty, you can double check the value of the content. There is a large amount of compatibility of presentation tools with Raptivity's software, too. Lots of customization is possible; as well as alterations for visually or hearing impaired learners. You can use their Raptivity Linker add-on to form microlearning experiences. The eBook Interactive Learning Design: Using An Interactive Learning Software To Increase Engagement In eLearning Courses gives tremendous insight into how you can make content king again. By facilitating a platform which does that, by allowing 100% space to deliver magnificent content. In a worry-free and effortless manner. You are only as good as your tool. So, choose wisely when you are in the process of choosing an Interactive Learning Software. You have full control to make sure learners actually learn, remember and engage. All you need is a platform which is designed to do so. Making sure employees are and feel engaged, will help them retain that knowledge immensely. Which in itself will be the highest return on investment you could possibly conceive. Help them, help you. Make the best possible short-term decisions so you are sure you will achieve optimal long-term successes. 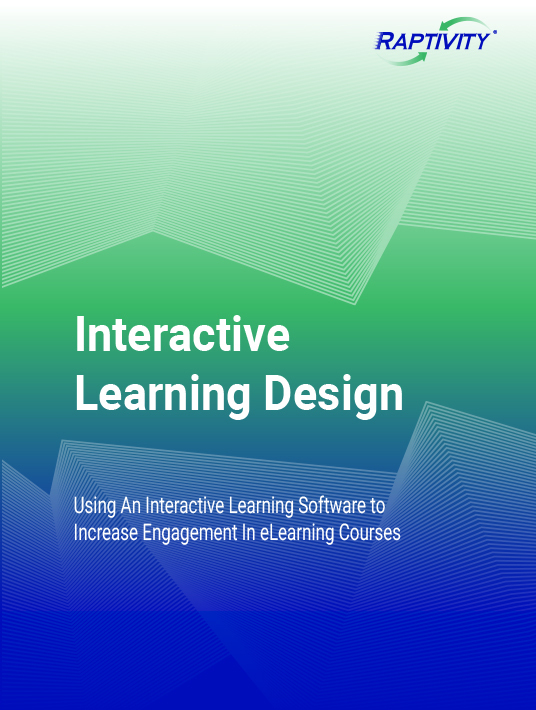 Download this free eBook that highlights essential elements of interactive learning design, hands you a ready-made checklist of what you need from an interactive learning software and covers best practices to drive engagement using its templates.